The chances are that if something new is about to hit the mainstream, it has been on trial in the friendly village of Parkhurst in Johannesburg first. The Parkhurst Residents and Business Owners’ Association (PRABOA) created Go-Green to stimulate renewable energy usage in the village. “As part of our Go-Green campaign we are planning a number of solar-powered electric vehicle charging points in the village. With this in mind we are very excited to introduce the community to the Nissan LEAF,” says Cheryl Labuschagne, chairman of PROBOA. A fleet of Nissan LEAF 100%-electric vehicles quietly rode into town this week in preparation for a special family weekend in the village. The weekend’s festivities have been created by Nissan South Africa in celebration of the village’s Go-Green renewable energy initiatives and it will introduce the community and any other inquisitive Jo’burger to the Nissan LEAF. “The Nissan LEAF naturally attracts forward-thinking customers that admire not only the engineering, but Nissan’s underlying philosophy of creating future-friendly cars. 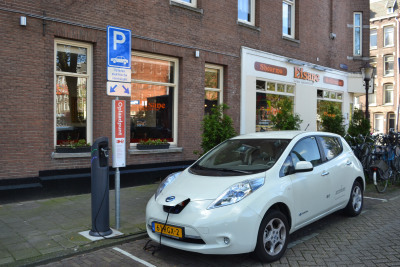 We are very excited about Parkhurst’s plans and decided to whet their appetite by providing a fleet of Nissan LEAF models for the weekend,” says Mike Whitfield, Managing Director of Nissan South Africa. The Nissan LEAF has more than 200 000 drivers worldwide. It was named 2011 World Car of the Year and won similar titles in Europe and Japan, thanks to its class-leading range of 195 km and regenerative braking. Since its introduction all LEAF models have travelled more than a combined 1 billion fuel-free kilometres. Since its introduction in South Africa, the LEAF has become the catalyst for Nissan’s campaign for sustainable and clean motoring, which led to partnerships with energy utilities and the Department of Environmental Affairs, who operates a fleet of LEAF vehicles. The fleet of Nissan LEAF 100%-electric vehicles will be stationed at Verity Park on 6th Street in Parkhurst. Anyone interested in test-driving LEAF for free can visit the park from 14:00 – 17:00 on Friday 10 April and from 07:00 to 17:00 on Saturday 11 April and Sunday 12 April. As part of the event anyone who has tested the Nissan LEAF will be treated to a coffee at any of the participating coffee houses in Parkhurst. Nissan will also reward one lucky test-driver with solar installations in their home to the value of R40 000. A luminescent wrapped Nissan LEAF will also be part of the evening activities. Not known to just start the party and then leave, Nissan South Africa will support a community cleaning project that will impact well beyond this weekend’s activities.